This article will show you how to add the PayPal function to your public website so that you can securely collect money. The PayPal function is added using a simple control. The function can be used for donations or to pay for items such as tickets to events or to sell items for fundraising; it's all up to you! 1. Click the Admin button in the navigation menu on the left. 2. Under the Public website heading, locate Public website editor and click the Select button. 4. Locate the page that you want to add the PayPal function and click View. If you don't have a page that will house the PayPal function you can create one now by clicking the Add new item icon. The page will show at the bottom of the list. Move the page to where you need it. 5. In the upper right corner, click Edit. You will now see your page in edit mode. 6. 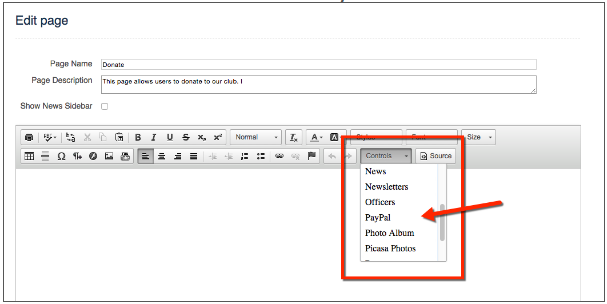 Place your cursor in the location on the page where you want to add the PayPal control. 7. Click the Controls button in the edit bar and select PayPal from the menu. This will put the PayPal control image in the content box. 8. Click Save and Publish button in lower left. The next page will display as show below. 10. Now you'll configure the control so that you can receive payment through PayPal. PayPal User Account - Enter the account email address where you want payments sent. If you don't have a PayPal account already, you will need to go to PayPal.com to set one up. Currency - Select the currency that you will collect the funds in from the drop down menu. "Thank You" Message - Type in the message that you want the payer to receive once they make a payment. The payor will receive this message on the screen once they complete the transaction. Donation Mode selection - You have the option of providing a "textbox" where the payer can enter the amount of the payment. 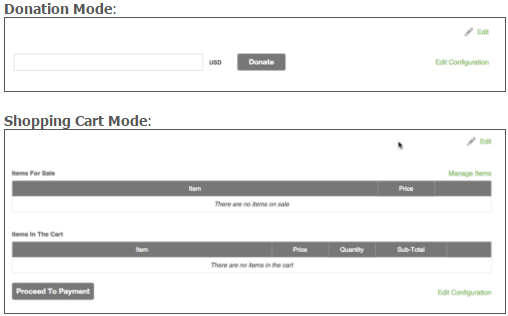 If the box is deselected, you can create a page that provides a shopping cart with specific items and amounts. Ask Payer's Address - Select box is you would like to request the payer's mailing address.